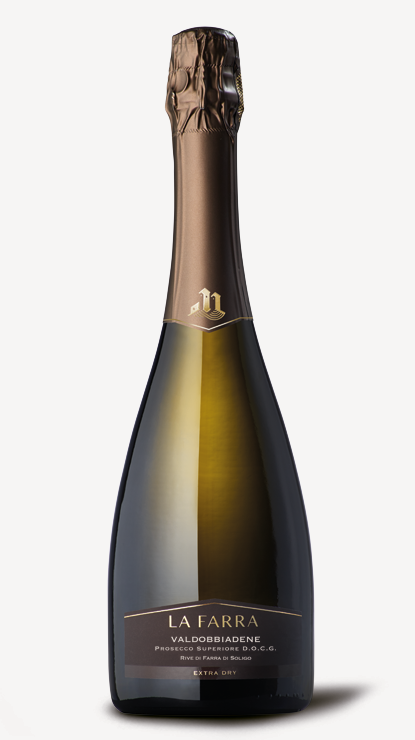 “Spumante Italia” bottle, 0.75 l.
Created from a “Cru” of grapes coming from the vines on the high hills of Farra di Soligo, cultivated directly by the firm LA FARRA. Limy soil, with the “Double-arched cane” cultivation method used. Fermentation without the skins with delicate pressing and slow fermentation, app. 15 days, at a controlled temperature of 18°C. The wine is then racked and kept in special stainless steel vats at controlled low temperatures. Charmat method, which is traditionally used for young, delicate and aromatic wines. Second fermentation in pressurised vats for 25-30 days, at a controlled temperature of 16-18°C, and maturing varies between 2 and 3 months, again in pressurised vats. Excellent as an aperitif and with fish hors d’oeuvres. Ideal to end a meal with delicate fruit pastries and fresh creams. Colour: Straw yellow with greenish highlights. Flavour: Well-balanced, with a really delicious tanginess.